Christmas Cactus or Thanksgiving Cactus are so named as they usually blossoms in winter when most other plants aren’t flowering. Wonderful to be added to one’s garden. It’ll surely delight you with its prolific flowering of spectacular colours. It is sold primarily around the holiday season as gifts or decorative items. 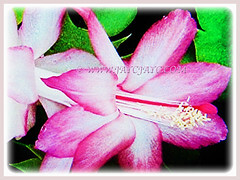 Botanical Name: Schlumbergera truncata (syn. 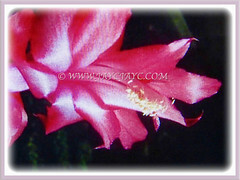 : Schlumbergera truncatus, Cactus truncatus, Zygocactus truncatus, Epiphyllum delicatum). 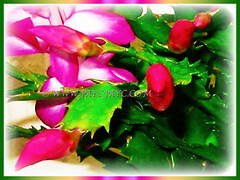 Common Names: Christmas Cactus, Thanksgiving Cactus, Holiday Cactus, Zygocactus, Crab Cactus. Etymology: The genus Schlumbergera, is in honour of Frederic Schlumberger (1823-1893), a French collector of cacti and other succulent plants. The specific epithet truncata in Latin means abruptly cut off and refers to the shape of the ends of the stems. Origin: Native to south-eastern Brazil. It is also cultivated worldwide. Plant type: An ornamental and perennial cacti. Features: Schlumbergera truncata is from the genus, Schlumbergera that consists of about six species of flowering plants. They are a favourite with hybridisers who have introduced numerous hybrids with flowers of marvellous and varied colours. They are usually epilithic plants, growing on trees and rocks. Stems are either leaf-like segments which grow from end-to-end. Flowers are showy, tubes with recurved petals and may be radially or bilaterally symmetric. 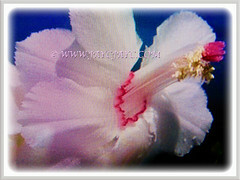 Usually the very attractive flowers are bright red, pink, purple, white and even bi-coloured. It has leafless green stems which act as photosynthetic organs. The stems or cladodes are composed of strongly flattened segments, which have two or three teeth of varying shapes along their edges and at the ends. The ends of the stems are truncated rather than pointed. Individual segments are about 4–6 cm in length and 1.5–3.5 cm wide. Special structural characteristic of cacti called areoles, occur between two teeth at the end of segments. The areoles which have brown wool and bristles up to 3 mm in length are where the flower buds appear. The flowers are held at a constant angle somewhat above the horizontal with the higher side different from the lower side (zygomorphic, specifically bilaterally symmetrical). The flowers are about 6.5–8 cm long and 4–6 cm wide.There are six to eight tepals that may be of various colours, including shades of red, orange, pink and white. The outer tepals at the base of the flower are shorter and bent backwards while the inner tepals are longer and fused together at the base to form a floral tube. The lower inner petals are bent backwards so that the upper inner petals appear longer. Nectar is produced at the base of this tube. 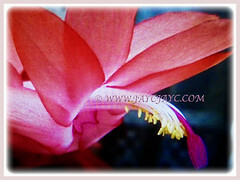 A characteristic of the genus Schlumbergera is that the many stamens are arranged in two series, the inner stamens form a ring around the style and the outer stamens arise from the floral tube. The filaments of the stamens are white, the anthers and pollen being yellow. The style has six to eight lobes at its end and is dark red. Most species require cross-pollination to set seed. The fruits of Schlumbergera are small berries and do not open spontaneously when ripe. When ripe, the fruit is red, pear-shaped, and about 1.2 cm long. The shiny seeds are black, each about 1 mm across. The birds will eat the seeds and pulp contained in the fruit, thus enabling to propagate new plants. 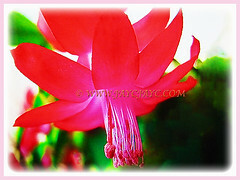 Culture (Care): Schlumbergera truncata or Holiday Cactus can be easily grown with least maintenance. Light: Semi-shade or filtered sunlight. Too much light causes the stems to take on a reddish colouration. Nonetheless, very low light will prevent flowering. Moisture: Moderate water needs. Keep the soil just moist throughout the year. They may be damaged by both under- or overwatering. Others: Schlumbergera likes to be fertilized in the warm growing season to promote new growth and vigour to established stems. Feed once monthly with a cactus fertiliser. Generally free from serious pest and diseases. Nevertheless, do watch out for mealybugs, aphids, soft brown scale, red spider mites and root rot which can be prevented by avoiding excessive watering. 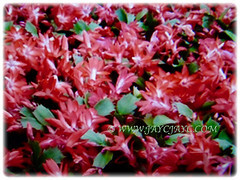 Schlumbergera or Christmas Cactus tend to bloom in the winter months when most other plants are semi-dormant. 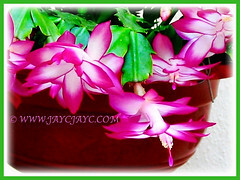 Early Schlumbergera bloomers are called Thanksgiving Cactus whilst later bloomers are known as Christmas Cactus.Plants flower in the autumn around May in their natural habitat. It requires short days and long nights to induce flowering. 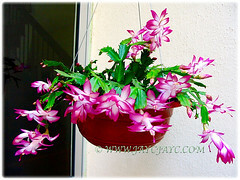 During hot summer days, water Schlumbergera a few times a week and more often during very hot temperatures. Water less during cooler weather in winter. In winter Schlumbergera are growing slower so less water is required but they need to be kept moist at all times. Do dry out between watering. Humidity and good airflow is necessary. Grow them as houseplants in hanging pots. Full sunlight is beneficial in midwinter, but bright sun during the summer months can make plants look pale and yellow. Ideal growth occurs at temperatures between 21°C to 26.66°C during its growing season from April to September. Do not let temperatures rise above 32.22°C once the flower buds are set in the fall. Continuous warm temperatures can cause flower buds to drop. Reduce watering from fall through spring. Fertilize plants monthly from the time new growth starts in late winter or early spring, and throughout the summer using a one-quarter strength soluble fertilizer. Reduce fertilizer during the fall and early winter. 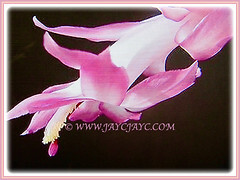 The Thanksgiving Cactus flowers best when kept somewhat potbound. Repotting is necessary only about once in three years. Propagation: Easily propagated vegetatively. Take short pieces of the stem, 1-3 segments long, twisted off rather than cut. Allow the cuttings to callus for 1-7 days at the broken end and then root in an open growing medium. Usage: Schlumbergera or Christmas Cactus that produces showy and colourful flowers will be excellent in hanging baskets or decorative pots. Schlumbergera truncata is suited to be grown outdoors as an epiphyte or in rock gardens. Ideal too to be grown indoors as a houseplant and located at a brightly-lit window sills. Schlumbergera with pendulous flowers will be wonderful in hanging baskets. Great to be given as a holiday season gift to friends and neighbours.